Although the Yankees lost to the Seattle Mariners on Thursday, they are still nine games above .500 and own the second-best record in the American League. 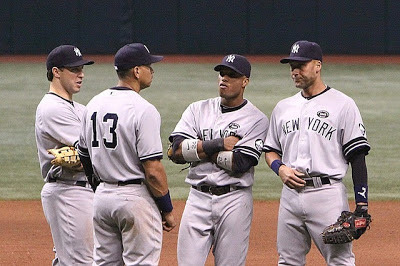 They may finish as bottom feeders in 2013, as the experts predicted, but the first month and a half has been a success for the Bronx Bombers. However, the Yankees encountered yet another injury in the loss at Yankee Stadium. While they are not too concerned about Andy Pettitte leaving in the fifth inning of his start with a tight left trapezius muscle, he is one of the many hobbled men in pinstripes this season. According to the New York Times’ recent post on injured players and their impact on respective payrolls, the Yankees are already tied for having the most players on the disabled list in 2013. Yet, they still have won an American League-best seven of their last 10 games. Amazingly, the Yankees have done this with mostly average pitching and average hitting. The roster may have contained CC Sabathia, Hiroki Kuroda, Mariano Rivera and Robinson Cano for the first 41 ballgames, but the team has became the 2012 Baltimore Orioles thus far. One year after the Orioles were one of the best one-run teams in MLB history, the Yankees are 8-3 (.727) in games decided by one run this season. This could be the magical year that Brian Cashman has been hoping to come across. If the Yankees end up getting solid production from Mark Teixeira, Derek Jeter and possibly Alex Rodriguez as well as some luck in close games, they could find themselves atop the AL East at the end of September. For more MLB coverage, follow Adam Lowenstein on Twitter at @StatsAdam.